PHILADELPHIA — FBI Director James Comey abruptly announced Sunday that Hillary Clinton should not face criminal charges related to newly discovered emails from her tenure at the State Department, lifting a cloud of uncertainty that has shadowed the final days of her presidential campaign. 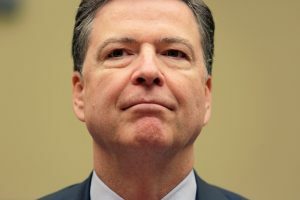 In a letter to congressional lawmakers two days before Election Day, Comey said the FBI has worked “around the clock to process and review a large number of emails” obtained from a device belonging to Anthony Weiner, the disgraced former congressman and estranged husband of top Clinton aide Huma Abedin. Comey said the review has not changed the bureau’s assessment from earlier this year that Clinton should not be prosecuted for her handling of classified information at the State Department. Clinton’s campaign welcomed the FBI announcement. “We’re glad this matter is resolved,” Jennifer Palmieri, Clinton’s communications director, told reporters traveling with the campaign to Ohio. Clinton was infuriated by Comey’s decision to alert Congress late last month that the FBI was reviewing new materials, calling it “unprecedented” and “deeply troubling.” The decision shattered what had appeared to be Clinton’s solid grip on the race and emboldened Republican Donald Trump. Trump landed in Minnesota for a rally moments after Comey’s announcement. He made no direct mention of the FBI decision and continued to insist —without evidence — that Clinton would be under investigation during her potential presidency. But he also delivered blistering criticism of Clinton, calling her and her team “extremely careless” with her handling of national secrets. Clinton had appeared to be heading for a sweeping victory before the FBI review, but Comey’s announcement blunted her momentum. Since then, national polls and battleground states have tightened, though Clinton still appears to hold an edge over Trump in the campaign’s last moments. During remarks at a black church Sunday morning, Clinton urged voters to choose “unity over division” as she sought to close a caustic presidential campaign on an uplifting note. She warned that President Barack Obama’s legacy is on the line, part of her strategy to shore up black voters who may be less enthusiastic about her than the president. “If we come together with the common vision, common faith, we will find common ground,” Clinton declared. Clinton also planned to campaign alongside basketball superstar LeBron James in his home state of Ohio and appear in New Hampshire with Khizr Khan, the Gold Star father who delivered a stinging indictment of Trump at the Democratic convention. Her high-wattage allies also fanned out across the country, including President Barack Obama, who was joined by musician Stevie Wonder at a rally in Florida. As the campaign’s final weekend drew to a close, more than 41 million Americans had already cast their ballots in early voting. Trump opened a furious day of campaigning in Iowa, the battleground states where he appears in the strongest position. He also planned to make stops in Minnesota, Michigan and Pennsylvania, three states that have reliably voted for Democrats in presidential elections, as well as Virginia, a state Clinton’s campaign believes it has a solid hold on. Trump’s campaign manager Kellyanne Conway told reporters Sunday that Trump planned to keep up the breakneck campaign pace through Election Day. After voting in New York Tuesday morning, Trump was expected to return to Pennsylvania, Michigan, Ohio, North Carolina and New Hampshire later in the day, Conway said. The businessman was also facing criticism for a new ad that asserts the “establishment has trillions of dollars at stake in this election” and features photos of billionaire George Soros, Federal Reserve Chair Janet Yellen and Goldman Sachs chief executive Lloyd Blankfein, all of whom are Jewish.